Throughout Lisa Yee’s latest Super Hero High novel, Barbara Gordon was slowly accumulating all of her iconic bat accoutrements. She had her grappling hook, her batarang, her bat bola, her spring-coiled bat boots, and her batcycle. Naturally, she kept all of her top-secret “Barbara-Assisted Technology” hidden away in a Bat-Bunker. Her batty behavior sounds familiar, doesn’t it? Bruce Wayne has been doing the exact same thing for years. But hold on a sec. In the DC Super Hero Girls universe, Bruce Wayne doesn’t seem to exist. Like it or not, his absence leaves a big bat-sized hole in Batgirl’s debut novel. Which is weird. Superman was mentioned in Yee’s previous Supergirl book (read our review here). And similarly, you’d think a Batgirl story would contain a small nod to Gotham’s most famous nightcrawler. These Super Hero High novels don’t exist in a bubble, after all. Yee and her comic book-writing partner Shea Fontana have been wildly inclusive when it comes to using the full lexicon of DC characters. It makes us wonder why Batman (of all people) wasn’t invited to the superhero party. Maybe he’ll show up at some point. And maybe he won’t. Who knows? But for now, Batman’s brooding presence wasn’t part of the narrative and that allowed Barbara Gordon to establish her own singular bat-inspired alter ego. As a youngster she looked up to her dad, GCPD Commissioner James Gordon. And more than anything, she wanted to be a crimefighter when she grew up. Being allowed to enroll at Super Hero High School was a dream come true for her. Putting on a cape and cowl was inevitable. But like all new transfer students, Barbara was at a disadvantage – especially at a school chock-full of goddesses, kung fu masters, shapeshifters, mind readers, mutants, and aliens. While she had been attending public schools in Gotham City, her new classmates had been nurtured at superhero preschools, elementary schools, and middle schools. Barbara was a smart cookie, no doubt about it, but she knew she’d have to step up her game if she wanted to keep up with Wonder Woman, Lady Shiva, Star Sapphire, and Miss Martian. After a few missteps and one big doozy of a final crisis, Barbara eventually found her comfort zone at school. 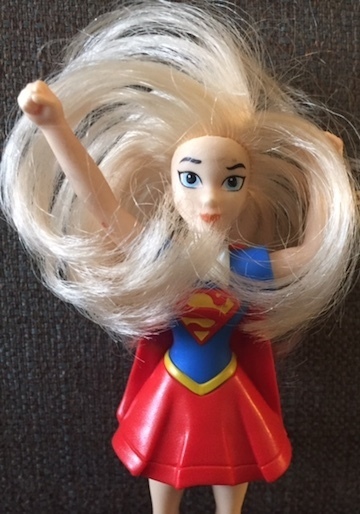 Supergirl, naturally, was a big help. The two legacy characters established an easy World’s Finest-like camaraderie right away. “We make a great team!” said the teenybopper from Krypton. At one point, the kids at Super Hero High were asked to name the most powerful weapon in the world. Their answers were immodestly predictable. “Swords,” said Katana. “Power rings,” said Green Lantern. “Sonic booms,” said Flash. The answer, of course, was none of the above. “It’s your brain,” said Lucius Fox, the school’s weaponomics teacher. “It’s your brain and your ability to access it to its fullest. A keen mind can overcome any obstacle.” To underscore the moment, Big Barda leaned over and gave Batgirl a good-natured nudge. “You’ve totally got this covered,” she said. This entry was posted in Marvel/DC, Published in 2017 and tagged Batgirl at Super Hero High, DC Super Hero Girls, Lisa Yee. Bookmark the permalink.